This article originally appeared in the Sep/Oct 2004 issue of Native Peoples magazine (www.nativepeoples.com), the leading periodical of the arts, culture and lifeways of the Native peoples of the Americas. Shonto Begay, Changing of the Guardians, Acrylic on Canvas, 66" x 24"
To be selected as a Best of Class winner at the annual Santa Fe Indian Market is one of the finest badges of honor a Native artist can receive in this life. Culled from hundreds of talents entrants, the selected artists show they have mastered the technical elements of their art; but beyond this, that they have embarked on a creative journey of great originality and creative thought. Such is the case with . 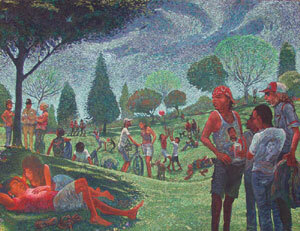 . . Shonto Begay, who secured the Best of Class award in 2003 in paintings/drawings/graphics. Shonto Begay, Citation on the Green, Acrylic on Canvas 60" x 72"
Working primarily in acrylics, Begay poignantly captures the sometimes harsh realities of that spirit of existence for those living on northeastern Arizona’s Navajo reservation. 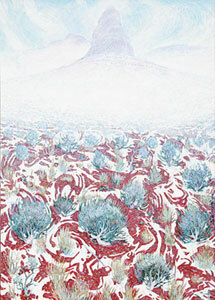 As gentle swirls of color whisper across the artist’s canvases, telling stories of old Chinle, faded pickup trucks and intoxicated roadside gatherings, his mastery of detail emerges unexpectedly from the smallest and seemingly most mundane of places: the lines on an old man’s face; the curled toe of a dusty boot; tire tracks on the soft earth. These subtle yet powerful details give Begay’s work a sense of familiarity, making it accessible to a wide range of admirers. 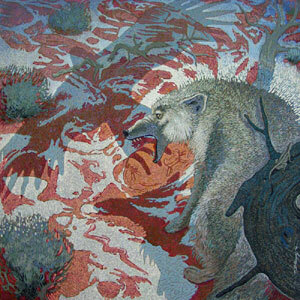 Shonto Begay, Blessed, Acrylic on Canvas 24" x 20"
Shonto Begay, Drama Upon the Thaw, Acrylic on Canvas 46" x 46"
Begay, who has been drawing since childhood, studied painting formally at the Institute of American Indian Arts in Santa Fe and at California College of Arts and Crafts, from which he earned a bachelor of arts degree. 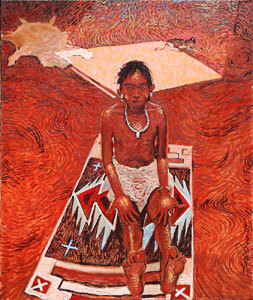 He has received many awards and recognitions for his provocative, neo-Impressionistic works, and his canvases have illuminated the walls of many important museums throughout the country, among them the Heard Museum in Phoenix, Wheelwright Museum of the American Indian in Santa Fe, American Indian Contemporary Arts in San Francisco, the Museum of Northern Arizona and the Smithsonian Institution (from which he received a Native Artist Fellowship). Shonto Begay, Spider Woman and Twelve Yei, Acrylic on Canvas 48" x 36"
Begay is also a successful, award-winning writer, authoring poetry and short stories reflective of his Native heritage. At present he is working on a novel, and autobiographical account no doubt as rich in nuance and detail as are his brushed works. 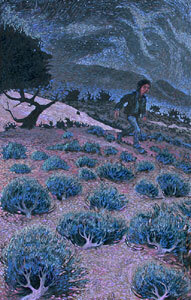 Shonto Begay, On the Path Past the Witch Tree, Acrylic on Canvas 66" x 42"